Chris Costello Is the Founder of Toe2Toe, an Organization That Provides Homeless People With Socks and Shoes. Sometimes, it only takes one experience to change a perspective on life. This was the case for medical student Chris Costello. While he is used to being the person who works with patients, he found himself on the other side of the patient’s bed in 2012 at Saint-Luc’s hospital, where he became friends with his hospital roommate, Matt. Costello recalled asking him if he had floss; a seemingly innocent question. However, due to a substance abuse problem, Matt didn’t have teeth. Naturally, he said no. Costello would often forget about this and would end up asking the same question, the words coming out of his mouth faster than he could stop them. One day, he asked Matt if he had toothpaste. Again, he realised that wasn’t likely and immediately regretted asking the question. However, Matt said yes. “Why do you have toothpaste?” Costello asked, confused. “Because I like to put it on my gums,” he explained. The 38-year-old was left dumbfounded at the time by this simple answer. It was the first time he was confronted with a reality that was drastically different from his own. The Montreal-native was pursuing his studies in medicine, working in different hospitals across the United States. Meanwhile, Matt was homeless, trying to find his way back to his home province of Prince-Edward Island. Having no teeth is but one of the potential issues faced by homeless people. So Costello, curious, began asking him questions about homelessness. Once again, Costello was stunned by his friend’s answer. It wasn’t clothes, shelter or hygiene products. It was socks. 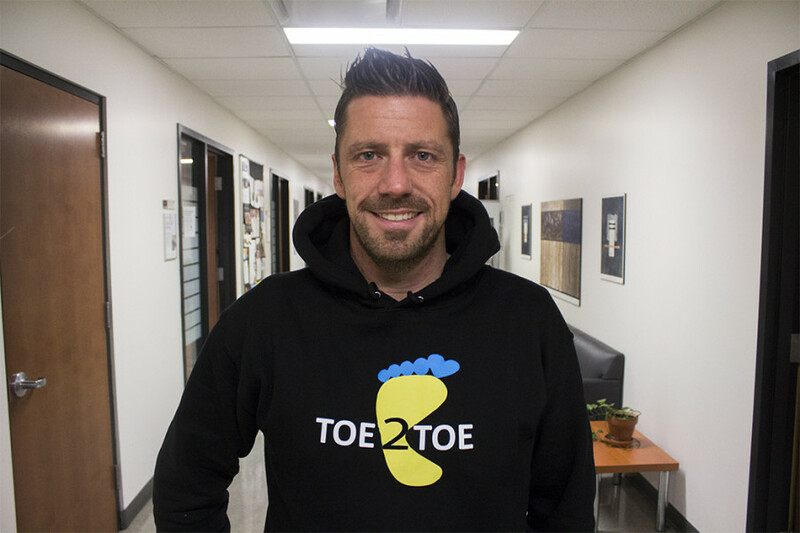 It was this encounter with Matt, combined with Costello’s past medical experience, that inspired him to create Toe2Toe, a non-profit organization that donates socks and shoes to the homeless population of downtown Montreal. His goal is to shed light on an important issue with serious health consequences. Through his experience in the medical field, Costello noticed that homeless people often checked-in to the hospital with foot problems. Costello knows that feet are breeding grounds for bacteria. If people are walking outside without shoes or socks, he explained, they will be more prone to sickness. In some cases, this could lead to infection and amputation. Costello teamed up with Accueil Bonneau, a social reintegration program that strives to keep people off the streets. He collects monetary donations to help pay for the socks, which are then distributed by Accueil Bonneau. He is also working with Raffi Zaroukian and Trenton Miller, two MBA students from Concordia University—the latter is also the Stingers’ quarterback—who act as consultants for Toe2Toe as part of a community service initiative offered at the John Molson School of Business . This program counts for three course credits. While the founder of the organization is the medical expert of the group, JMSB students help him with the marketing and branding aspects. The most challenging part of advertising his organization is making the medical science interesting and understandable to people. Unlike Costello, most people aren’t so excited to hear about bacteria. Costello has collaborated with the football team to make a promotional video with Miller. Moreover, the Stingers collected socks and monetary donations when they played against the McGill Redmen at Concordia Stadium on Oct. 22. The cold, rainy weather stopped many fans from coming, explained Miller and Costello. They still managed to raise $220 and 180 pairs of socks. “It’s a start, but that’s not the end goal,” the quarterback said. Indeed, it is just the beginning for Toe2Toe. Costello collected roughly 15, 000 pairs of socks last year. He wants to double that amount annually by maintaining an inventory of 30,000 pairs. Many of his donations come from high schools and postsecondary institutions. Working with high-school students is especially rewarding for Costello. He challenges the kids to understand the importance of giving back to the community, a concept he feels they fail to grasp. “A lot of times, you speak with students and ask them what [they did] in regards to community service,” Costello explained. “And they’ll have answers like ‘well I donated to cancer.’ ‘OK well what did you do?’ ‘Well I gave money.’ ‘OK well what kind of cancer?’ ‘Well I’m not sure’.” He said that the learning aspect of community service is lost. In 2015, he worked closely with students from Sacred Heart School and Kuper Academy, where kids donated 2500 and 5000 pairs of socks, respectively. Students were thrilled when they received a letter of thanks signed by homeless people benefitting from their contributions. “The kids get fired up for doing something and then getting feedback,” Costello said. They also ask about Matt. Whenever Costello visits a different school to give a presentation on Toe2Toe, the students often ask him if they still talk. Unfortunately, they don’t. Costello takes their interest in his relationship with Matt as a sign that his message about giving back to people in the community is coming through to them. “They understand that if they play soccer, maybe they change their socks three or four times, and that there are some people that wear three socks for months,” said Costello.